E-Scrap and E-Waste Shredders are high torque, low speed, dual shaft shredders in a choice of 45, 55, 60, 80 and 100HP models. They produce shredded pieces that are the width of the cutters times a variable length. All of our e-scrap shredders include double hooked cutters, self-cleaning combers, a direct drive and auto reverse. They will shred hard drives, backup tapes, keyboards, cell phones and other assorted e-scrap. E-Scrap & E-Waste Shredders utilize a right-angle drive, which results in a compact design that requires minimal floor space. Bearing protection prevents shredded contaminants from reaching the bearings through the use of false walls and seals. 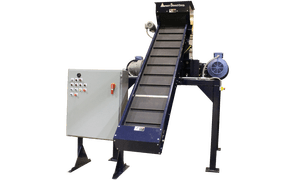 The size of the hopper and motors, along with the cutter profile, will depend on what is being shred as well as the required particle size and throughput. All of our e-scrap and e-waste shredders are designed for your specific application. Need help selecting which shredder best meets your needs or looking for a quote?